Pictured is Mrs. Lisa Loechner's 5th grade homeroon class, which raised $1,800 to aide in the relief efforts in Japan. A check was presented to Westport-based Save The Children on Tuesday. Everyone from local school children to the music community has pitched in to raise money for relief efforts to help Japan, where an earthquake and tsunami, followed by a nuclear emergency, wreaked havoc nearly two months ago. Recent donations in the Westport/Fairfield community include checks handed over to Westport-based Save the Children and the Japan Society of Fairfield County. At Long Lots Elementary School, fifth-graders raised $1,800, while a musical fundraiser at the Fairfield Theatre Company on March 21, featuring pop, rock and soul music, brought in $5,190, according to organizer Beth Iovinelli. 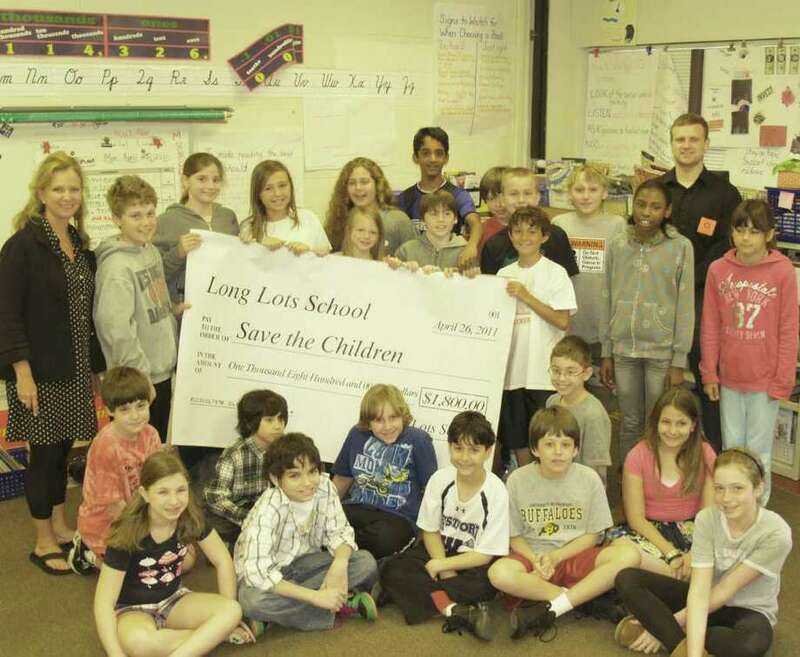 The children in Lisa Loechner's Long Lots homeroom independently held fundraising activities, as well through a Save Japan Committee that met during recess and lunch sessions. Two baked-goods sales, a spare change collection and the designing and selling of 200 "Save Japan" bracelets took in about $1,800. "We are thankful for the efforts of these students, as their generous donation will make a difference in the lives of many children in Japan," said Jason R. Chmura, manager of Save the Children's Community and Volunteer Engagement Resource Development, during the recent check presentation. Iovinelli, who not only organized "Jam for Japan" at FTC, but was also a featured vocalist in the program, handed over her check from the concert proceeds to a representative of the Japan Society on April 20.